A wood finish is a clear, transparent coating applied to wood to protect it from moisture and make it look richer and deeper. It differs from paint, which is a wood finish loaded with enough pigment to hide the wood. It also differs from stain, which is a wood finish and a colorant (pigment or dye) with a lot of thinner added so the excess stain is easy to wipe off. The remainder just colors the wood; it doesn’t hide the wood. Unfortunately, the term “finish” also refers to the entire built-up coating, which could consist of stain, several coats of finish (a “coat” is one application layer) and maybe some coloring steps in between these coats. For some reason, we have only one word to refer to both the clear coating used and to all the steps used. Usually, the context makes clear to which is being referred. A finish serves two purposes: protection and decoration. Protection means resistance to moisture penetration. In all cases, the thicker the finish the more resistant to moisture. Three coats are more protective than two or one. Boiled linseed oil, 100-percent tung oil and wax dry soft and gummy, however, so all the excess has to be wiped off after each application to achieve a functional surface. Therefore, no significant thickness can be achieved. Protection is limited with these finishes. Finishes decorate by making wood look richer and deeper. The impact is less on unstained lighter woods such as maple and birch and greater on stained and darker woods such as cherry and walnut. • A large number of two-part, high-performance finishes used in industry and by many professional cabinet and refinish shops. The most common are pre- and post-catalyzed lacquer and catalyzed (“conversion”) varnish. Scratch, solvent and heat resistance – Oil-based varnishes and high-performance finishes provide the best scratch-, solvent- and heat resistance. Water-based finishes are next. 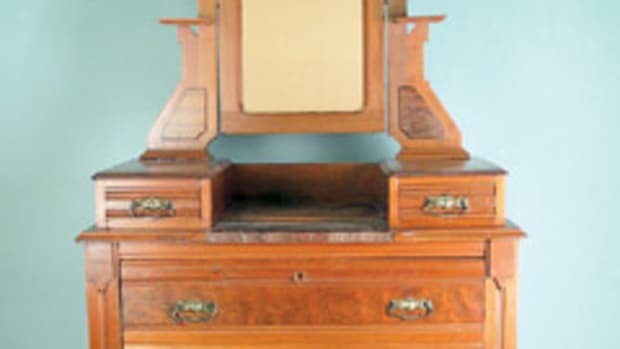 Shellac and lacquer are susceptible to all three types of damage. Oil is too soft and thin to be effective. Color – Water-based finishes add no color to the wood. All other finishes add some degree of yellow/orange coloring, with oils, varnishes and orange/amber shellac adding the most. Drying time – Shellac, lacquer and high-performance finishes dry the fastest. Water-based finishes are next. Varnish and oil require overnight drying in a warm room. Safety – Boiled linseed oil and 100-percent tung oil are the least toxic finishes to breathe during application because they don’t contain solvent. Water-based finishes (thinned with water and a little solvent) and shellac (thinned with denatured alcohol) are next. Oil-based varnish thins with mineral spirits (paint thinner), which some people find objectionable but which isn’t especially toxic. Lacquer and high-performance finishes thin with solvents that are the most toxic to be around. The first coat of any finish seals the wood — that is, it stops up the pores in the wood so the next coat of finish (or other liquids) doesn’t penetrate easily. This first coat raises the grain of the wood making it feel rough. You should sand this first coat (with just your hand backing the sandpaper) to make it feel smooth. You don’t need a special product for this first coat unless you have one of two problems you want to overcome: difficulty sanding or something unwanted in the wood. Alkyd varnish and lacquer gum up sandpaper when sanded, so manufacturers of each provide a special product called “sanding sealer” with dry lubricants added to make sanding easier and speed your work. Sanding sealers weaken the finish, however, so you should use them only when you’re finishing a large project or doing production work. Sometimes there’s something in the wood that causes problems. These include resinous knots in softwoods that prevent the finish from drying, silicone oil from furniture polishes that causes the finish to bunch up into ridges or hollow out into craters, and smoke and animal-urine odors. The finish that blocks all of these (“seals them in”) is shellac and should be used for the first coat. Notice that, except for resinous knots, the problems are associated with refinishing. Oil-based varnishes, water-based finishes, lacquers and high-performance finishes are available in a variety of sheens, ranging from gloss to flat. 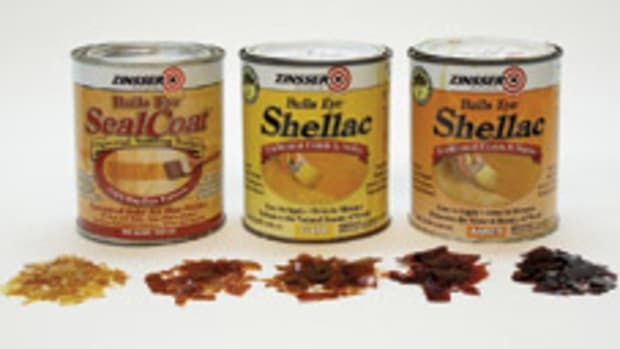 All sheens, other than gloss, are created by solid-particle “flatting agents” manufacturers have added to the finish. The more flatting agent added, the flatter the sheen. These flatting particles settle to the bottom of the can, so you have to stir them into suspension before each use. You can get any sheen you want by pouring off some of the gloss from a can in which the flatting agent has settled, then blend the two parts. Or you can mix cans of gloss and satin to get something in between. Oil, wax, wiping varnish and gel varnish can be applied with a cloth or brush, then wiped off. The other finishes are applied with a brush or spray gun. Brushing is very intuitive; essentially no different than brushing paint. Spraying is also fairly intuitive, but spray-gun care and tuning is more complicated and spray guns and their sources of air (compressor or turbine) are considerably more expensive than brushes. • Brush marks and orange peel, which can be eliminated by thinning the finish 10 to 30 percent so it levels better or increasing the air pressure for spray guns. • Runs and sags, which can be spotted quickly by watching what is happening in a reflected light, then brushing them out. • Dust nibs, which can be significantly reduced by keeping your tools, finish and air in the room as clean as possible. • Bubbles, which can be eliminated by brushing back over to pop the bubbles or thinning the finish 10 to 30 percent so the bubbles have more time to pop out. No matter what the problem, you can always fix it by sanding the finish level and applying another coat.